Today on Christmas, my family is reminiscing on yesterdays as we count our endless blessings. Rummaging through Christmas storage boxes, I found this old tattered book!! 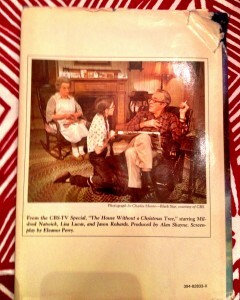 Does anyone remember this CBS special with Jason Robards that used to air every holiday season?! I looked forward to it quite a few years in a row. The special, which won an Emmy in 1973, was based on the story of the same name by Addie Mills. My mother found this book for me one Christmas knowing how much I adored the show. It’s the story of a 10-year old girl’s struggle with communication with her father that comes to a head when he refuses to buy a tree for their home one Christmas. The message of empathy, generosity and growth in relationships still resonates with me today. Hmmm . 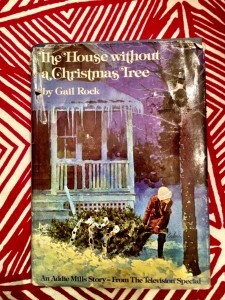 . . perhaps recounting this story so often as a young girl made me extra exuberant with holiday decorating. Hosting a cozy get together with cousins I haven’t seen in years may be another reason this special year. 🙂 My house holds three proudly standing soldiers this season: the white “Rudolph” themed tree, the main tall red/nutcracker/dance themed tree, and an extra tree this year for my visiting niece and baby cousins – the Disney character/Barbie tree. Happy Holidays to all!!! May the new year hold dreams achieved, goals reached, and new blessings born. 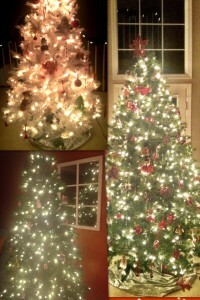 Three trees in my home this year!